The University of Guyana (UG) hosted its annual career fair and open day, at its Tain Berbice Campus on April 5. The event was attended by hundreds of students from various Primary and Secondary schools across regions 5 and 6. In attendance too were representatives from both government and private agencies. In his keynote address, Vice-Chancellor and Principal of the University of Guyana, Professor Ivelaw Lloyd Griffith, reminded the packed auditorium about the importance of education. 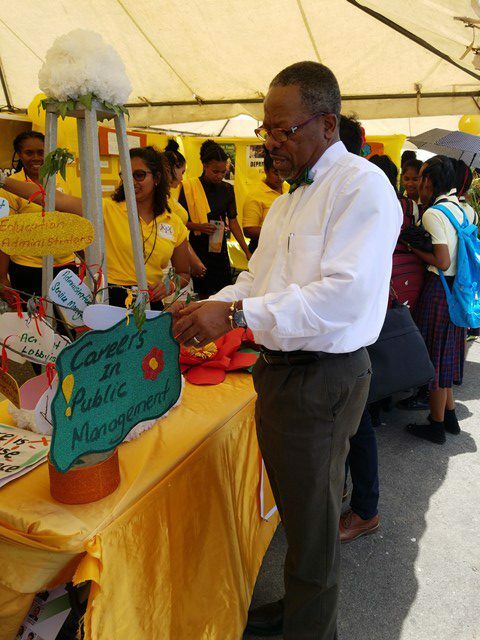 Professor Griffith encouraged the pupils to take advantage of all levels of education that Guyana has to offer and to focus on achieving excellence. “When you come to the University of Guyana or whatever university you go to, don’t take education for granted; use it to be an agent of change,” he emphasised. Also, making remarks was Director of University of Guyana Berbice Campus (UGBC), Professor Gomathinayagam Subramanian, who acknowledged the organisers for hosting a successful programme. He also extended appreciation to the pupils who attended the edifying initiative. During the day’s proceedings, students took advantage of the close to 30 booths that were set up across the university’s lawns. They were provided with information about different companies and institutions in Guyana. The viewers were also fortunate to participate in experiments and interactive sessions where they were given tokens for their correct answers. Speaking to the Department of Public Information (DPI) was fourth former and student of the New Amsterdam Multilateral Secondary school, Amera Khan, who explained how intrigued she is by the knowledge gained from the one-day fair. Khan, who aspires to be an accountant, said ” I think today was really good, I got to see everything. I am in the business stream and so I visited the accounts booth and saw the different items that they displayed and the information they handed out amazed me”. “I think this activity today was very educative because most students got to understand each and every booth,” Shivanie (only name given) from the Berbice Educational Institue commented. When asked which booth grabbed her interest, the third form student noted the social work programme. “By studying this area, you learn about human beings, their relationships and how you can understand them,” Shivanie explained. The aim of the open day and career fair is to apprise the students about the various options available to them so that they can make informed decisions. It is the third such event to be hosted at the Tain Campus.